40 Days on The Camino Pilgrimage starting in St Jean de Port France ending in Santiago, Spain. 39 Nights lodging on the trail – Mostly in rural Hotels – always a private room with private bath. 3 star Hotels in the larger cities. We are also looking at a step up option with Hotels and Country Cottages. You will have the option to either walk with a group, or walk solo each day. Nurse on your travel team for any minor medical needs such as blisters. Individual Alberque Options for as little as $10 euros per night. Are You Ready for a Life Changing Trip? 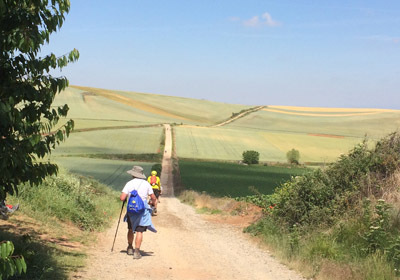 The Camino – it is our intention to again walk the 500 mile Camino across Spain. Morgan wants to walk it backwards from Finisterre to St. Jean France. Gregg wants to follow last year’s route. Either way, it’s time to go back for another trek. There is something magical about the Camino that is calling us back. Israel – Gregg plans to embark on a pilgrimage in Israel. There is just too much history here to pass up walking in Israel. Russia (Red Square) – Paul McCartney brought some much needed awareness to the importance of peace in Russia. We have found a great desire to experience his lyrics in the Red Square. All 50 States in the USA– Details have not been set but we are formulating a plan for a walk across each state. Appalachian Trail – One of our very close friends is pushing for our company. All Continents – It is then our intention to walk on all seven continents. It looks like an incredible journey!